I guess it's fairly obvious that the two wooden sections screw together to make one seventy inch long stick. When not using The Swing Thing, be sure to store it flat on the floor. Don't leave it connected and leaning in a corner. Each one has a slight bow to it and leaning it in a corner will only make the bow greater. The final product will come with a handsome carrying case. If any product testers are interested in a case for their Swing Thing, send me some mail and I'll give you the details. The main focus of this page is to get the pendulum attached and set to the correct length. This swing training device is not a fancy apparatus. 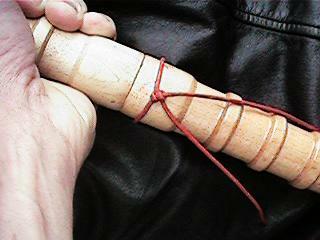 If you know how to tie a double knot the pendulum can be securely attached. 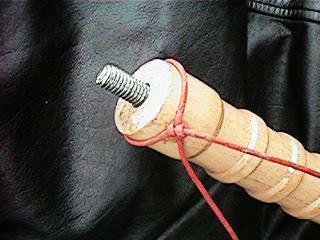 Start out by attaching one end of the leather tether to the hitting ball. 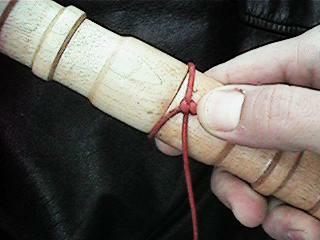 After tying it around the ball, adjust the knot so that it is centered on the red ring. Test this by suspending the ball. You don't want the ball to look as though it's shifted to one side. You want it hanging straight down. At this point the product does not come with a center attachment piece, although one may be included with the final product release. Use the following technique for attaching the pendulum and the product will function properly. After the two sides are tightly fitted, slide the loop to the middle. 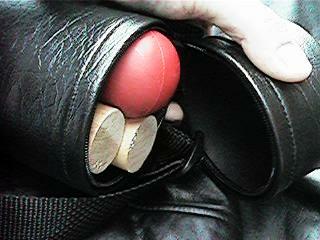 Slide the loop back on to the short fat before breaking down the Swing Thing and it's ready to go for the next use. Pendulum length - We want to be able to swing the pendulum freely while it remains attached to the center of The Golden Swing Thing. Yet we also want to have it strike somewhere on the long fat, preferably between the end of the logo and the end of the stick. Determining proper length - Stand upright. With the stick screwed together and the pendulum unattached, hold the Swing Thing vertically and set one end to the floor. If your navel positions itself somewhere above the first three nubs you can probably set the pendulum length all the way toward the end of the stick. If your navel positions itself from the third nub or lower you may need to shorten it up a bit.